New research from Stellenbosch University (SU) in South Africa shows that, in an extraordinary case of adaptation, the disproportionately long front legs of South Africa's oil-collecting Rediviva bee species have evolved in response to the equally long oil-producing spurs of snapdragons. "This is one of the few examples where a pollinator had to adapt to the flowers that it pollinates, rather than the other way round," explains Prof Anton Pauw, lead author of the article 'Long-legged bees make adaptive leaps: linking adaptation to coevolution in a plant-pollinator network', published in the Proceedings of the Royal Society B: Biology today (13 September 2017). Prof Pauw, an evolutionary ecologist in the Department of Botany and Zoology at SU, says pollinators often hold the key to understanding the genesis of floral diversity. In other words, the flowers of plants have adapted to their pollinators in spectacular ways in order to be able to reproduce. 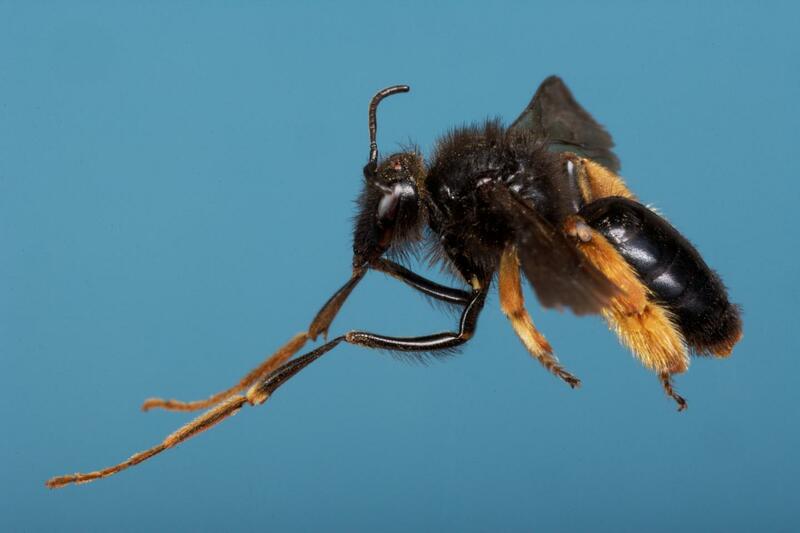 In this case, however, the little-known Rediviva bee species have developed front legs of varying lengths – from 6.9 to 23.4 mm long – in order to reach the oil produced deep at the back of the snapdragon's twin spurs. The length of these spurs also vary from species to species, with 70 species in the largest genus of oil-producing flowers (Diascia). The bees' front legs are coated in a dense pile of velvety hairs that soak up the oil, which is then mixed with pollen to form a super-nutritious bread for the larvae in their underground nests. The oil is also used to line the walls of these underground nests. Working in collaboration with researchers from Germany, the United Kingdom, Belgium and the United States of America, Pauw used DNA analysis to produce a family tree for 19 of the 26 Rediviva species: "We were able to show that very closely related bee species often differ dramatically in leg length and that this divergence could be explained by differences in the spur length of the flowers that they visit." Documenting the network of interactions between the oil-collecting bees and the 96 plant species from which they gather oil, required many years of observation. Many of the oil-secreting plants flower only the first year after a fire. Prof Pauw says the next step would be to do a phylogenetic analysis of snapdragons (Diascia), to test whether flower spur length and bee leg length evolved simultaneously as one would expect if bees and plants were coevolving: "In this scenario, plants and bees evolve together in a sort of evolutionary dance." He says it is important, from an ecological perspective, to understand these interactions: "Oil-collecting bees are threatened by man's activities, in particular by urbanization. By understanding their role in generating and maintaining plant diversity, it might be possible to predict and ameliorate human impacts". Co-authors on the article are Belinda Kahnt, Michael Kuhlmann, Denis Michez, Graham A. Montgomery, Elizabeth Murray and Bryan N. Danforth.